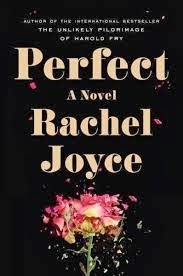 Last year the book The Unlikely Pilgrimage of Harold Fry gained a lot of attention for author Rachel Joyce, so I was happy to see that she has a new novel, Perfect, out. This is a story of the friendship between two boys and how one incident can change lives forever. The book jumps back and forth between 1972 and today, although it's not apparent at first that the time is shifting. That is in line with the rest of the book, which concerns time and how it impacts our lives. In 1972, two boys, James and Byron, go to private school and live fairly privileged lives in England. James, who seems to Byron to be much smarter and more confident than he is, mentions that 2 seconds are going to be added to the calendar in order to align leap year with the Earth's rotation (or something like that). For some reason, this announcement preys on Bryon's mind and makes him worried that something terrible is going to happen. You can't just play with time like that, can you? He begins obsessing over when these seconds will be added, and what effect it will have on his life. Byron and his younger sister Lucy live with their parents in a large house in the countryside, although is father is away working throughout the week. Byron's beautiful but highly strung mother Diana is driving the children to school one day in a thick fog when she decides to take a short cut through the (horrors!) housing estate for the "lower classes" on the outskirts of town. While she's attempting to negotiate through the fog, Bryon sees his watch stop, then re-start. Obviously, he's just witnessed the addition of the two seconds. He thrusts his watch in front of his mother's face to show her, and she slams on the brakes. When she starts the car again, Bryon sees a bicycle on the ground, and a little girl lying motionless next to it. His mother continues on as if nothing has happened, but Byron knows she's hit the little girl. Being a worrier (as we've seen), he immediately tells his friend James what's happened. This starts the boys on Operation Perfect -- their investigation of the "crime" and attempts to get Byron's mother to take responsibility for what happened to avoid further trouble. They make observations, take notes, and come up with a plan to solve the problem. Diana, for her part, is totally dominated by her older husband. He is very suspicious and calls every day, interrogating her on where she's been and what she's doing. She is obsessed with keeping schedules and making sure everything is kept to her husband's exacting standards. It's a full-time job and one that never seems to make anyone happy. When Byron tells her about the little girl, she refuses to believe it until she spies a small fleck of red on the hubcap of the car, and decides it must have come from the girl's bicycle. She takes Bryon along as she goes to the housing estate in search of the little girl's parents. Unfortunately, from there I had a sinking feeling. The "lower class" mother, getting an eyeful of the expensively dressed Diana pulling up in a Jaguar, sees her opportunity when Diana comes to ask about the little girl and any possible injuries. Soon Beverley (the scheming mother) is visiting Byron's house every day, and items start mysteriously disappearing. While at first Diana seems happy to have a friend, things only get worse from there. Just how far will Beverley go to exploit Diana's guilty conscience and fear of exposure? Alternating with the 1972 events are chapters about "Jim." He lives in a van and has obsessive compulsive disorder. He has to complete numerous rituals every day to ensure that "nothing bad happens." He tells of being a resident in a mental institution for most of his life, until it was closed and the residents were parceled out to relatives or (as in Jim's case) pretty much left to fend for themselves. He has a job at a restaurant, but because of numerous shock treatments he endured, he is not able to speak very clearly, so he avoids most personal contact. It takes a while to figure out that Jim's story is happening in modern times, and not at the same time as the 1972 events. Toward the end of the book there is a "twist" which I'm sure is meant to catch the reader off-guard, but I didn't find it as unsettling as perhaps I was meant to. The explanation of how things came to be as they are now in the modern sections of the book seemed a bit rushed and unclear. Still, it was interesting to sit back and wait for events to unfold.